Get your kids in the kitchen for this one! Beets are fun! Really! 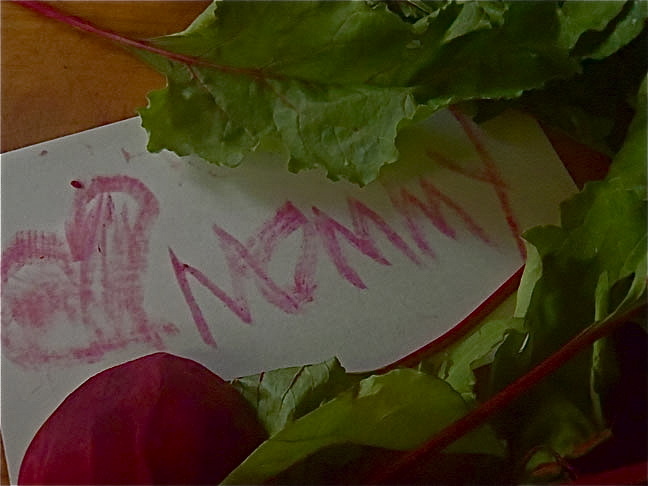 And if your little ones aren’t into cooking, beets make a fantastic coloring tool! My boys love that you can draw with beets. They also like helping me arrange the beet slices on the baking sheet and sprinkling the salt. Not only are beets delicious but they are also extremely good for you. Beets are rich in iron and have been shown to be an immunity booster and a guard against cancer. 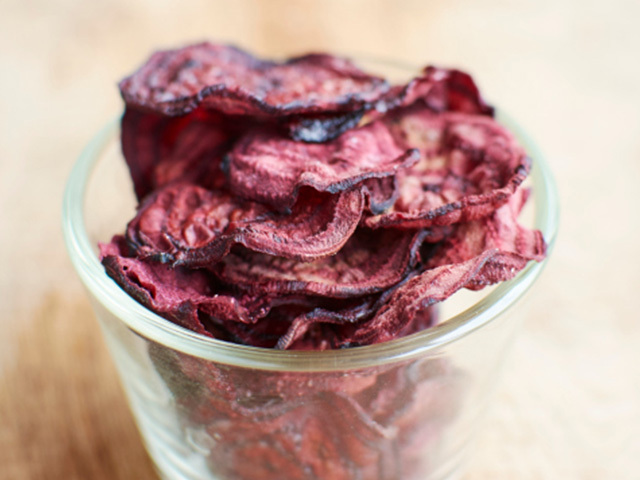 This beet chips recipe makes a great snack and a perfect addition to a child’s lunch box! And don’t stop there — beet chips are also a yummy side dish with dinner. I especially like them with a saucy meat dish, Braised Short Ribs, for example. My kids love finding these chips in their lunchboxes. Step 1: Preheat the oven to 200 degrees and line two baking sheets with parchment paper. Step 3: Thinly slice the beets in a food processor with the slicing attachment, or use a v-slicer. Step 5: Cook them in the preheated oven for about 1 1/2 hours. Then turn the heat up to 375, and cook until crisp, about 15 more minutes. Check them periodically as all ovens (and all beet slices) will vary. If you don't have a food processor or a v-slicer, you can use a knife, making the slices as thin as possible. The thinner your beet slices, the more quickly they cook. The food processor is the fastest method. It's a wonderful idea to save your beet greens and cook with them! Try my Beet Green and Spinach Stir Fry!